Description: UP three unit freight. UP Huntington Sub. Description: 489 is pulling out of Moterm in Fernale with their intermodal pickup bound for western destinations. Description: A mixed freight, headed by CN 2580, approaches the yard at Belleville, Ontario. Description: 407's three Dash-9s have the train of mostly autoracks rolling at track speed as they cross the big fill near Laurie Park. Description: With three big GEs leading todays train, 407 is underway for Truro, NS having left Dartmouth Yard, only a few minutes prior to this. Description: Having met 120 at Kinsac, 407 is back up to track speed as they approach Mile 25 of the Bedford Sub. 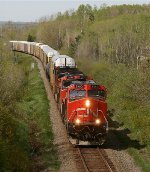 Description: CN 407 is rolling under clouds after such nice sunny weather in Halifax, true Nova Scotia weather. Description: CN 407 is passing the Truro VIA Rail station holding the main, while 515 sits in the hole with their van, ready to shove east. Notice the van lights are on! Description: Seen on the other side of 515, as they get closer and closer to the A-Yard. Description: After their pickup in truro, the chase was on again with 407, last photo of 407 for the day though and last usable photo from the day. Description: CN 331 speeds through headed for Sarnia. Description: 15th Ave. 1133 hours. Description: CN 2532 leads an eastbound mixed freight at Burlington, IL. Description: CN 2580 trails an eastbound mixed freight at Burlington, IL. Description: Southboundfreighter approaching Herald Road - with two 'Draper Taper' locomotives trailing the Dash-9.